It was a very pleasant day down at Derbyshire's favourite branch line with good passenger numbers on all services. At Wirksworth station we welcomed a day with the driver guest from the East Lancs Railway who was ably looked after by John Allsop and Richard Buckby. The Pullman Buffett enjoyed a steady stream of customers with the teams' home baking proving very popular. Down the yard the LMSCA continued their restoration work on the brake third open and the DMU restoration team continued their work on the class 119. The DST set about the task of repairing the steam leak on No. 3 and half way through the day the team had made little progress in removing the steam pipe. 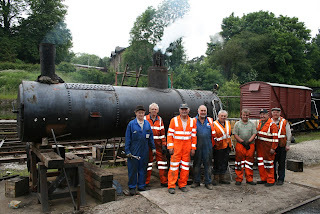 The 8F support crew came to the rescue and by the end of the day the combined talents of both teams resulted in all the troublesome bolts being removed ensuring the steam pipe can be braised tomorrow. We welcomed two new volunteers on their induction today and congratulations go to John Jarman and Rolph Wegmann who successfully completed their guards training. Finally thanks go to Pete Watts who attended to some problem vegetation in the vicinity of footpath 4 that was scratching the carriages as they passed. The main event today was a Drive a Diesel Experience Day with the first use of the Class 33 for this important revenue generator. The owner's representatives had to make some late adjustments to the loco leading to the morning session being dmu based. However, after lunch the Royal Saloon was attached to 33035 and a most successful afternoon was held to the delight of our participants and their guests. My thanks go to John Allsop, Richard Buckby and John Evans who entertained and delighted our customers. There was much energy put into repairs around Wirksworth station including the Wash Green dock "crossing gate" that has seen much better times. David N improved the waste disposal from the Buffet Car but further work will be required to ensure we aren't creating further problems. The Booking Hall and Pullman Buffet Car played their part in entertaining our customers and a mix of visitors that just came to have a look a us. An unusual day when the weather varied between thunder and lightning, hail through to warm sunshine that challenged our working parties to the extreme. The PWT were the real heroes as they greased a further 22 fishplates in the most unpleasant conditions whereas the VCT, wisely, stayed at home base to give their storage container a makeover yielding untold hidden and forgotten mementos including a delightful two Midland Railway boundary posts which we have decided will look well at Duffield. More painting for Allan! We also welcomed a regular customer who wished to test a hand held rail flaw detector. They nearly gave up as the rains fell but completed their activities between showers. Disappointingly No3 was failed which caused some urgent conversations with tomorrow's driver experience customers. Luckily all were contactable and damage was limited although, unfortunately, there will be no steam on the Bus Rally Sunday. The DST believe they can rectify the fault relatively quickly which is quite essential as we have another Steam Experience Day booked for a week on Friday. Much progress was made with the Bubble Car renovation and our dmu fleet was fed and watered for the upcoming weekend. The Watt Bolt Fettling Company was gently refurbishing fishplate bolts for further use and a cheque has been drawn, reluctantly, for a further small supply next week. The Booking Hall and Pullman Buffet Car traded their wares to a rather small supply of visitors. However, our customer's reprehensive were drawn into the warm environment of the Buffet Car to our benefit. The PWT set off for a very serious day of fishplate greasing and achieved a record 44 pairs representing half a mile of hard work. A great amount of work which brings them within a mile and a half of Idridgehay and resulting in some 40 bolts being replaced. Also on the PWT front Bob and Tony pushed the track recording trolley from Shottle to Duffield and reported another first as the information was downloaded onto computer at Wirksworth the same day for detailed analysis. Modern and Ancient technology in harmony. Back at base John "Pullman" Allsop completed the lining out of the Up (East) side of the three vehicles and applied the first two Pullman crests which look stunning. There was also further progress with the "Bubble Car" as it nears the application of paint and a welcome return to our operational fleet. The Filing Fairy has been in go mode with much progress being made with our record keeping. The Booking Hall and Pullman Buffet Car have seen a satisfactory footfall though the day. Tim mowed all the grass between the Incline and Road 3 which looks very well cared for now and Mick Kingsley completed a strim of the embankment at the entrance to Wirksworth which, again, makes the premises look good. Photo attached of the new view from the Booking Hall for arriving visitors. A curate's egg of a day as passenger carryings were not world beating but catering were put to the test with a very late request for 30 lunches. This request was in connection with a project undertaken by Derby University students looking at our contribution to the Wirksworth Regeneration project and hosted by Eric Boultbee on our behalf. Meanwhile the planned service was operated by the Lidgett, Tait and Buckby team efficiently and offering our take on life with its ingredients that seem to work well. Today's service was supported by the Booking Halls at Wirksworth and Duffield together with the EVRA shop that all combine to entertain our visitors. It was good to welcome a visitor from the other EVR, the Eden Valley Railway who collected a great number of magazines and a redundant grass cutter found lurking in the skip. John Allsop has started to deal with the lining out of the Up, East, side of the Pullman set and Fred & Iris did a welcome clean up of the Mess Hall. Tony Watt replaced two defective fishplate bolts in the area of footpath F4 and then refurbished 9 bolts for reuse. This, what seems to be, mundane work is essential to the safe running of our trains and I would welcome more participants in this area of work. Without sounding trite, which I confess I am apt to do, all the energy spent in restoring locomotives, carriages and wagons comes to nought if there is no track to run on. Today also saw another tremendous first as Henry Ellison's boiler had its first steam test reflecting great credit on all involved. The collective view was that it must be 40 years or more when the loco was last in steam. This is not a bad achievement given our rather Spartan conditions and the team deserve three cheers for achieving the impossible. A group photo is attached that shows the team minus Neil and Dave who spent too long over lunch. Progress Monday 25th June 2012. Another pleasant sunny Monday meant unfortunately that work on the cwr section had to be postponed due to excessive temp so to plan B greasing fishplates. However, due to several other hundred or so interested parties organization of the work today took the logistical skills of several million ants transporting 100 tons of beef cattle through a city centre during a firestorm. Anyway, Mike Billings wanted to go flailing ( with the komatsu ), vct wanted to work at bridge 24, p way wanted to work in 40 steps cutting and the weed killing team wanted to work in the middle of everybody else, oh, and can we go home early so you'll have to move out of the way several times. So, said convoy left Wirksworth with the komatsu leading followed by the vct then p way with the multicar bringing up the rear. P way managed to grease 40 pairs of plates but had to give up due to lack of bolts - fishplate greasing is now at mp 140 1/4 . Vct managed more fence to fence clearance at bridge 24 with 2 fires and clearing brash down to Jebbs lane after the komatsu had flailed. Weed killing team managed to finish off more mares tail in 40 steps cutting and further work in Wirksworth yard. Not to forget grass cuttung in Wirksworth yard by lone vct worker as well. Shottle station reopened today, 65 years and 11 days after it was closed by the London, Midland 7 Scottish Railway. 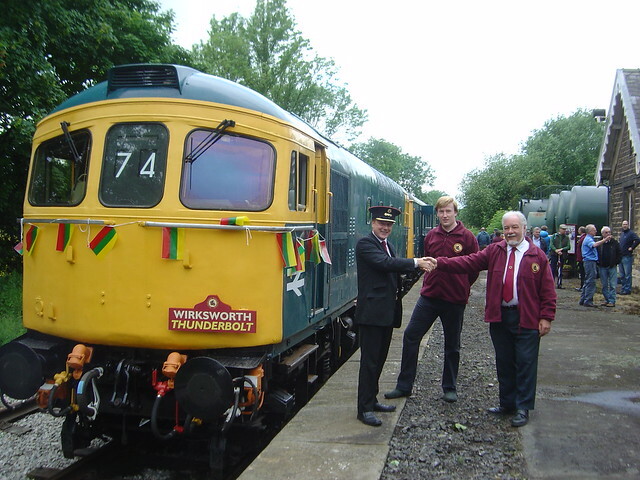 In this image, we see the inaugural service and present in the picture are (l-r) Anton Shone, Passenger Services Manager of the Ecclesbourne Valley Railway; Nathan Cooke, Volunteer; John Snell, Chairman of WyvernRail plc, the company that operates the Ecclesbourne Valley Railway. we did get a spare "private" sign just in case. Our Diesel Gala attracted a large number of visitors from near and afar. 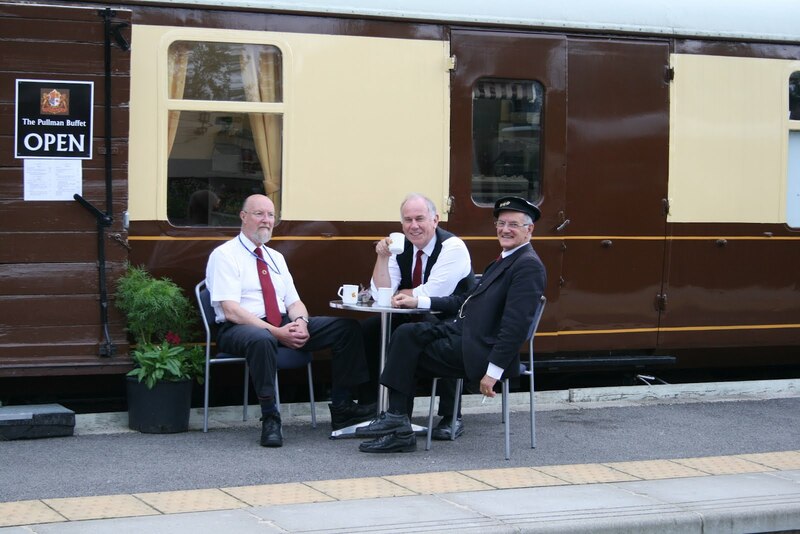 Coupled with the Triumph Sports Six Club rally at Wirksworth station this resulted in our catering staff working extremely hard to cope with a very busy Pullman Buffett and platform barbecue. Matt Higham and friends ran the miniature railway which proved very popular with our younger visitors who enjoyed travelling behind both steam and battery powered locomotives. The model railway was also open for most of the day. Down the yard members of the Steam Team were busy working on boiler gauges and the LMSCA continued the repairs to the north end frame of the brake third open. Due to some problems with the Class 33 load regulator the engine was withdrawn from service for a short time to allow the support crew to try and rectify the fault. A railcar service was provided on the incline during this time. Following some temporary adjustments that went some way to resolving the problem, the locomotive was 'top and tailed' with the class 31 to undertake the remaining Duffield trips with Iris providing passenger services to Ravenstor. My thanks to Pat Lidgett and Steve Parish for undertaking to drive at short notice. A dank, wet and cold day dampened our spirits but the show must go on. Our continued revision of our safety documentation culminated in a meeting held this morning with all the Safety Management Review Team attending and I am extremely grateful for the level of participation equalling many man hours. Preparation for the diesel weekend continued with several test trips on the Incline by the Class 33 with good results. A lone worker in the Weighbridge brought to life our new rail disc cutter and completed the overhaul of the recently acquired rail bender, or Jim Crow as they are often referred to. We welcomed a coach group from the Birmingham area in less than clement conditions and they were ably hosted by Patrick, Peter B and John R in a pre warmed Iris. The Booking Hall and Pullman Buffet Car traded in difficult conditions but made a contribution that is most welcome. The VCT moved into go mode to endeavour to prevent bovine intrusions that had troubled our services last weekend and on Tuesday. The fence was patched up and the upcoming weekend should not encounter beef on the hoof. They then returned to their main area of attack in the vicinity of the sewage works reporting some essential felling and a large fire. The PWT were frustrated by the weather which was extremely wet this morning and decided to complete ballast fettling just north of Hazelwood with a successful conclusion. The diesel team assembled the trains for the weekend with 31414 starting off the Duffield service on Saturday and 33035 commencing on the Incline. As a result of some background lobbying we are now the proud possessors of a manual rail bender on loan from Network Rail while we continue to fund raise for a more sophisticated version. Our thanks go out to Network Rail for this generous gesture that should allow the physical completion of the Shottle loop. The apparatus in the process of being refurbished after some years of inaction. The Booking Hall and Pullman Buffet Car had a relatively quiet day due to the prevailing weather conditions. You may reflect on the fact that the upcoming weekend has already involved the expenditure of £1600 in fuel. Other train operating costs will raise the bill to around £2500 and I sincerely trust this investment will be rewarded! Just to let visitors wishing to attend the Diesel Locomotive Weekend this weekend know that the proposed ASLEF strike affecting drivers at East Midlands Trains has been called off. 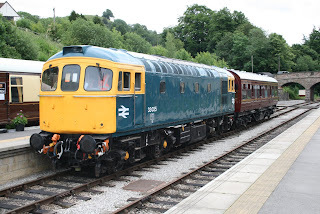 This is great news as the Nottingham-Derby-Matlock main line service which calls at Duffield will be running to normal timetable, allowing a great connection for the Ecclesbourne Valley. Another delightfully warm day prior to the deluge forecasted for the next few days. We entertained a small group from the West Somerset Railway en route for a few days in York. They had chartered Iris for a trip to Duffield with photo stops and enjoyed a buffet in the Pullman. Their visit was rounded off by a trip to Ravenstor and, in addition to the fares and catering receipts, donated £50 to the next web cam as our present three are much appreciated in Somerset. They were also anxious to meet the Filing Fairy who was, by luck, present today and whoose fame has spread far beyond the confines of Derbyshire. The PWT worked around today's charter by greasing an impressive 27 pairs of fishplates during the morning reaching the south end of the Bournebrook Avenue straight at Milepost 140 3/4 followed up by an afternoon of oiling up all the hand points at Wirksworth. Other parts of the team completed track patrols on the Incline and between Shottle and Duffield. A further detachment made progress in identifying the cuts still needed in the "long welded" section and placed the required fishplates in the correct area. The road/rail dumper had the benefit of a thorough greasing up and there was much ferreting in the steam locos ash pit to ensure only pure water is discharged into the drain. The Booking Hall had a most successful sales day and the Pullman Buffet Car welcomed a number of casual visitors. A very good day and I attach a photo of today's contented train crew. A rare day as the sun beamed down on us and it was warm enough to sit outside. This brought with it a most satisfactory number of customer for our "Market Tuesdays" trains including a small group from Allestree W I who visited following a talk about the Railway from JHT. Thanks go Patrick, Tom T and Richard B who really have knocked this Tuesday service into shape over what becomes a long day. The Booking Halls at Wirksworth and Duffield have done very well and Catering has had its best "normal" Tuesday - all most rewarding. Fred & Iris cleansed the Mess Hall in their inimitable style, if it were me I would be binning the unwashed plates and cups! David and Dorothy continued their round of our flowers displays at Wirksworth and Duffield rewarded by appreciative comments from our visitors. The LMSCA reported continued progress with their Brake Third Open and the DST were on quite a high with Henry Ellison's boiler having fitted the gauge glasses, fire bars, safety valves, wash out plug and mud hole joints. This makes the approach of a steam test of the boiler quite imminent. The Shottle project moved ever onward with Nathan and Essex Pete completing the footpath work. Work on the Class 33 in readiness for the upcoming weekend resulted in the discovery of a few faults that need urgent attention and the Komatsu rejoiced in the fitting of a new "O" ring and an expensive top up of its hydraulic fluid. The PWT comprising Tony and Doug patrolled the line between Wirksworth and Shottle tightening up fishplate bolts where necessary. Quite a productive day with new weekday revenue highs being achieved at Duffield and in the Pullman Buffet Car - onwards and upwards. A very pleasant day with the p way team greasing another 24 pairs of plates and preparing 22 pairs of plates with bolts for further cutting of the cwr. Fishplate greasing has now reached Gorsey Bank level xing. VCT were busy at br 24 cutting and burning trees and hedges right to the boundary and managed 2 fires today. Balfour paid us a visit in the afternoon to test and photograph newly developed laser measuring equipment. They bought out Laser Rail some time ago but it's been a while since their last visit so let's hope for more business in the future. Another earning day for the railway. The weed killing gang were out in force and completed a whole line execution of mares tail that seems to abound at the moment. The Station buffet also saw some business today with Balfour's men giving it a try as well. Mondays are starting to get busy. timetabled service train in 65 years, next Sunday at 10.42.
solution will be found to this in a very soon moment. Surprisingly good passenger numbers today despite the atrocious 'summer' weather. The first scheduled service to Duffield had to contend with branches, sheep and cattle on the line but still managed to keep to timetable! Our duty conscripts tackled cleaning the interior of the saloon and moved various objects to the appropriate storage facility. Work continued on the platform at Shottle and the team made good progress. Down the yard at Wirksworth a small band of DMU restorers put up more luggage racks in the class 119. Work continued too on the LMS brake van. A number of carriages, wagons and engines were shunted in the yard in preparation for next weekend's diesel gala. Both the class 31 and 33 received some fine tuning in readiness for the gala. In the mess room the Wirksworth soothsayer said his crystal thingy was getting hotter therefore the weather is going to improve soon. So you have it on good authority. Where did I put my sun block? PS A big thank you to everyone today who managed to smile, laugh and ensure our visitors enjoyed themselves despite the unseasonal weather. The significant event today was a steam experience day that entertained our customers and enabled the transport of a fitted van to Duffield and the return of one not required there. The clients were entertained by our activities and thanks are due to Mick, Hylton, John E and Tom T for ensuring all went well. The Shottle project also benefited by material being transported on the experience day to the desired location. The Booking Hall and Pullman Buffet Car benefited from our sundry activities. A pleasant surprise as the sun visited us for the first time for some weeks. This put a spring in the step of a small VCT as they tackled the vegetation in the area of Derby Road 1 bridge (DJW24) where reports of trees encroaching on the trains passage had been reported. The PWT concentrated on the vital but slow work of fishplate greasing as they advanced across the Hannages. Tony tended to his lone quest of resolving missing or corroded fishplate bolts which is all very necessary on our extended Railway. Keeping nine miles of line in a fit condition is quite demanding but essential to the safe running of our trains. The dmu maintenance team tended to the errant 3 Car set, fuelled Iris and prepared the two car set for service this weekend. Richard P continued our attack on weeds and prepared the Multicar for action next Monday if weather conditions permit. The Booking Hall and Pullman Buffet Car tempted our visitors and volunteers gathering a few groats along the way. Congratulations are due to the DST who worked late last night with the boiler inspector resulting in a successful hydraulic test of Henry Ellison's boiler. A great achievement after many, many hours of work. The LCC cleansed the three car set, Iris and the Training Room and we are ever grateful for this work that largely goes without appreciation but is so necessary for our reputation for presentation. Equally Tim, a new recruit, has steadily worked around both side of our Pullman fleet to clean the bodywork and windows, again, two full days of unsung work that ensures our visitors see well presented vehicles. On the same subject, without apology, Anton has made strides with blending in the new Information room but had the adverse effect of bringing on the rain in the late afternoon. At Shottle the boxing up, fettling and presentation of the loop line is now complete and some continued inspection of the line in the area of Hazelwood was accomplished together with some remedial work. We welcomed a customer who was ably hosted by Mick Thomas having satisfied the vehicle acceptance body and continued some tests that he wished to complete. In the Weighbridge at Wirksworth the rail saw received maintenance and a service to enable it to continue the rail cuts on the former long welded section including the fitting of a new silencer so it sounds less like a boy racer. The Pullman Buffet Car entertainer few customers on a bleak day but the Booking Hall took the advance of a lull to update the web site and progress a most interesting booking from the Branch Line Society. PS Just a reminder that the Rail Bender appeal is still open - around a further £3k is needed to enable us to place an order for this vital machine - donations, share applications or anything else should be made payable to WyvernRail plc - the sooner we can bottom this, the sooner trains can pass at Shottle. But, I have to say this will not be the end of the story as signalling and sundry other work will have to be funded! Our information web pages for the forthcoming Classic Bus Rally on the 1st July and the Classic Transport Weekend on the 21st/22nd July are now online at http://www.e-v-r.com/busrally/ and http://www.e-v-r.com/transportweekend/ respectively. They show the list of vehicles booked in to attend as they currently stand. We have had a fantastic number of vehicles wishing to attend and we are pleased to announce that we cannot take any more classic vehicles for the events as we cannot fit any more in! I am quite lifted by today's activities that represented the first of our Tuesday service days. Passenger numbers were encouraging although the train crew had quite an exhausting day following the failure of the three car set after its first run to Duffield. We then had to press Iris into working both services which gave our team a lot of exercise. Nonetheless, all trains ran to time and the passengers enjoyed their journeys with us. The Pullman Buffet Car achieved a Tuesday best and were kept pleasantly busy through the day. The EVRA shop also reported a steady trade. Fred & Iris gave the Mess Hall a well deserved clean and the DST reported that, after many weeks of endeavour, Henry Ellison's boiler is now ready for hydraulic testing. Rod and Mary who had been charged with fitting the vacuum brake system on the loco finalised that task today. The VCT concentrated on completing the "safety" fencing adjacent to the Incline and a short fence to deter the LMSCA from straying inadvertently onto Road 1 and I thank them for these useful additions. Mick K also managed to deal with overhanging growth in the area of Idridgehay station and Mike B gave the Komatsu a good greasing ready for its resumption of trackside flailing. The PWT "boxed up" seven panels of track on the Shottle loop formation and Doug oiled up a further two wagons there as part of the ongoing maintenance of our fleet. At Wirksworth the new Information Room was being put into corporate colours and further progress was made with the preparation of the Bubble Car for painting. Matters were coordinated from the Booking Hall at Wirksworth resulting in a modestly satisfactory banking this evening. 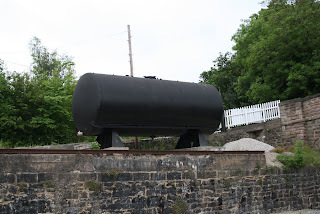 A visit was received from Wirksworth Town Council about diesel fumes at Gorsey Bank and we appear to have access problems onto Shottle platform. All matters that would send the most stout hearted into despair. I live for the day when an unexpected face appears to say "how can I help you, you seem to be doing so much for the community and tourism". Just ducked to avoid a flying pig. I will write when less jaundiced about the pay out by our insurers to a young gentleman and his solicitors after we hosted from a "back to work" scheme in the spirit of the "Big Society" - needless to say our premiums have risen to reward our generosity. Monday remains the quietest day of the week except for today! We were very pleased to welcome a charter group from Willesley Castle who travelled with East Midlands Trains from Cromford to Duffield and then enjoyed the luxury of our three car set on the journey from Duffield to Wirksworth. A couple of trips in Iris from Wirksworth to Ravenstor were sampled before lunching in the Pullman, the first time this year that the First Open had been pressed into use. A final Ravenstor trip was provided after lunch for those that wanted to walk up to the Steeple Grange Light Railway which was their next destination. The majority of the passengers elected to travel on the community buses from Amber Valley for their next excitement of a week long exploration of local railways. A great credit to Peter Binks who had put the programme together and suffered the stresses of a group organiser. Many thanks to Lewis, Chris B and Eric B together with third man understudy Tim who made the group so welcome together with Angela and her team that ensure they were fed and watered. Support also came from the EVRA shop after a long Bakewell Show weekend and the Booking Hall. The Pullman Buffet also welcome a number of casual visitors as well as some of our own team. Due to the charter activity we had our first late turn PWT where the Dogfish were loaded in the afternoon and tripped to Shottle in the early evening by No3. Again thanks are due to MKT. Hylton, JHT, David N and Charles Marsden for making this unusual addition to our working hours. In the background Tony tended to some loose fishplate bolts on the "racing straight" and Richard P was in weed control mode dealing with areas around the yard and from Ravenstor to Wirksworth. Not bad for our quietest day of the week! the Information Room at Wirksworth. platform bench in 65 years amongst much other preparatory work. The cold weather this morning did not deter our visitors and we enjoyed good passenger numbers on our scheduled services throughout the day. We welcomed a 'day with the driver' customer and his family from Lincoln who were most complimentary about their experience. Down the yard the DMU group split into two teams. One team set about a number of tasks including fitting a new wiper to the class 117 and repairing a fuel leak on a class 101. The other team had a barnstorming day with the refurbishment of the class 119 fitting side panel to the first class non-smoking, applying ceiling trim and attaching doughnut rings to the light fittings. In the shed Dan continued the restoration of the bubble car which is now ready for the first application of undercoat and the class 20 group started their planned maintenance programme on the locomotive. The quick fix fitters of the team dealt very efficiently with a set change due to problems with an unloader valve and managed to rectify the problem by the end of the day. Down at Shottle station, the dynamic duo of Anton and Tim set about painting the new fence at the platform end and made rapid progress. Finally, as the last service from Duffield pulled into Wirkswoth the sun came out which was a fitting end to a most productive and enjoyable day. Another day of unrelenting wet weather which is quite depressing as the prevailing conditions are really beginning to harm our ability to earn money that is essential to our continued wellbeing. Nonetheless we entertained four steam experience customers and two drive a diesel day participants. All were highly complimentary about their welcome and the enthusiasm of Mick and Hylton on No3 and John and Richard on the Class 20. These days, which are quite demanding of our team, do immense work in demonstrating our collective abilities. I am also grateful to John Evans who acted as guard on the morning's steam experience and the afternoon's diesel day. Productive work emerged from both enterprises with the Rudd being returned from Shottle and a fitted van being positioned at Duffield for Mike Evans. We entertained a customer during the morning who wished to test a hand trolley who normally uses a stretch of track at the National Railway Museum but was frustrated by the Railfest event being carried out at York. A very nice man emerged yesterday who can properly deal with the disposal of our waste oil and he has now cleansed the premises and several hundred litres of the stuff. It apparently is useful in the heat required for the laying of tarmac when roads are resurfaced. The Filing Fairy put in an extra day and met with the Operations Manager as we continue to improve our systems and make them more logical. I am sure everyone will appreciate that what we are doing is for our own safety and the demonstration to the outside world that we are quite organised in this area. My thanks go out to Dawn and Tom for the energy being put into this project. 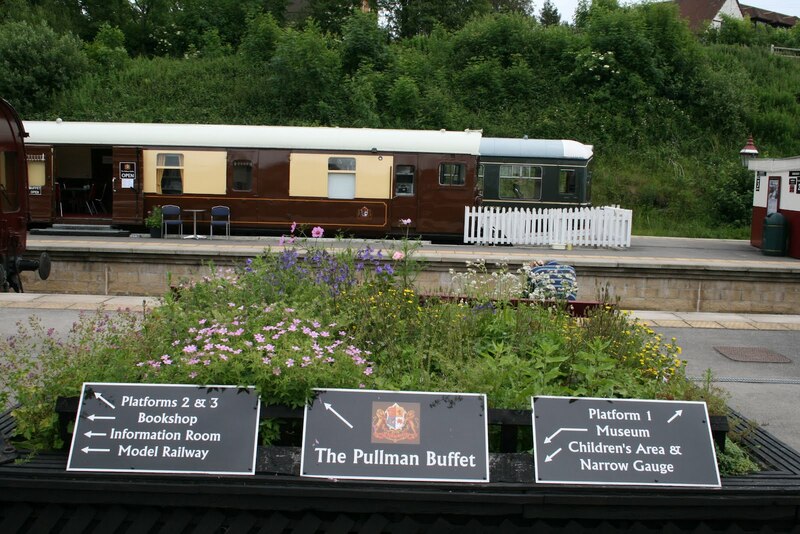 The Pullman Buffet Car and Booking Hall responded well to all our customers and visitors. A photo is attached of today's steam experience combination with the stove in the brakevan competing with the kettle attached to it. It's a wonder we achieved anything today as it was wet, wet, wet sapping any enthusiasm for our project. Nonetheless, after recovering some material from their Hazelwood base the VCT completed their safety fencing at the base of the Incline and the equally soaked PWT boxed up a further three panels of the Shottle loop. Two of the team then returned to Wirksworth to clear up the Weighbridge and threatened several forms of torture to anyone who deposits "useful" items from their latest garage clearout in their tidied up workshop. The service train crew carried few passengers and I really felt for the third man who was really soaked by the end of the day and we should all applaud this dedication. The new water tank had some of the residual muck flushed out and the Bubble Car benefited from undercover accommodation as its restoration progressed. An often unmentioned but equally necessary part of our enterprise was a talk by Neil to Quarndon Women's Institute this afternoon and he should be thanked for continuing to "raise our profile". Jam, Jerusalem and Wirksworth. A lot of stock movements were made to ensure D8001 can enter the Maintenance Facility at close of play tomorrow for some major bodywork repairs. The Booking Halls at Wirksworth and Duffield together with the EVRA shop tried to tease what money was about out into their tills. The Pullman Buffet Car had quite a good day considering the conditions and impressed a few people that were planning future party visits. I was greeted too early in the day by a surprise visit from Radio Derby which I hope resulted in a promotional piece being broadcast on the afternoon show next week. On arrival at Wirksworth this morning who should be sat waiting in his van but Mr Heap of fixing fire extinguisher fame. Head scratching time to sort out who was going to deal with Mr Heap and who should come driving in the yard but Mr Newby. Oh hello Dave, and how are you this morning - would you like a little job. Any way many thanks to Dave for dealing with this while John Evans was evicted from his bed to attend. Thanks John. With that attended to the Komatsu was run to Shottle to unload ballast from the rudd allowing the last 3 panels in Shottle loop to be jacked and packed. The bubble car had more attention with the front end painted in primer. Business in the buffet was brisk. Dawn Swepstone attended again to deal with further filing and chasing errant volunteers over their competencies or lack thereof. Many thanks to Dawn for keeping this side of our business in order - an absolute requirement given the Health and Safety culture we now live in. The annual fire extinguisher check was completed with just 4 having to be replaced out of the 40 or so on site. Another big expense for the company with prob no change out of £600 - £700. Not too many l's in Jubilee tonight and I trust no unwelcome spam messages will be generated by today's report but I can't be sure! We concluded four days of intense activity involving quite a large number of our team and today was no exception with the Booking Halls at both ends of the line in action, the dmu and steam train crews together with catering and the EVRA shop. Special thanks today go to Ben who not only acted as third man on the Duffield service but also offered a trolley service on three of these services. The revenue generation over the four days has helped the enterprise at a time when there are exceptional calls on our bank balance which peaks every year in May and June. Other activities featured as many of the volunteers wanted to get back to work. Tony Watt started this week's track inspection by covering the Wirksworth to Idridgehay section and I am grateful to Mick Kingsley for taking over the strimming from Pat Craft that keeps our banks at Wirksworth in trim. He then joined the rest of the VCT who were tackling the fencing at the base of the Incline. This is a valuable task as it prevents people from the Maintenance Facility inadvertently straying onto the Incline and causing alarm to the Ravenstor service. The DST had a frustrating day as their efforts to conclude the hydraulic testing of Henry Ellison's boiler revealed a couple of leaks that will have to be fixed before the boiler inspector can be summoned. Stuart showed me some of the work produced in his "machine shop" which are truly magnificent pieces of work and vital components for Henry Ellison's restoration. We are very lucky to have such skills available in house. The planters at Wirksworth received attention and the Newby team also tended to their Duffield equivalents. The LMSCA made further strides with the body frame work at the north end of the BTO. Nathan and Anton started to implement a well thought out temporary solution to the reopening of Shottle station in advance of the more substantial construction work to be encompassed this winter. With a fair wind they will enable trains to stop there as planned on the summer solstice. We welcomed a new member of the catering team who will start formally next Monday. Emma Oaks brings a wealth of experience and talent that will further develop our growing expertise in this area. Lastly, the attached photo shows our new nuclear containment vessel lifted most successfully into place this morning. The vessel also fulfils the role of a major investment by EVRA in working towards a plan to provide adequate supplies of water for steam locomotive operations and they should be congratulated in putting in place a substantial building block for the future with its capacity of 8000 gallons that will satisfy the most thirsty of locomotives. Once more, many thanks to everyone who put the effort into making the Jubilee holiday a successful venture for us. What a difference a day makes! Today was pleasant, sunny and reasonably warm injecting a feeling of wellbeing in our hard working volunteers and visitors alike. Quite a team was in place to man the Booking Halls, crew the trains, cater to the masses and run the narrow gauge, miniature railway and EVRA shop. My thanks go out to all who made it a good earning day. Engineering support was on hand and Rob deserves a special mention for his readiness to deal with any faults that arise on our dmu fleet through the day. The dmu team erected a further two ceiling panels within the Class 119. This completed the small first class no smoking saloon, an area I haven't frequented. 31414 was subject to further tlc with the roof repainted along with the north end warning panel. 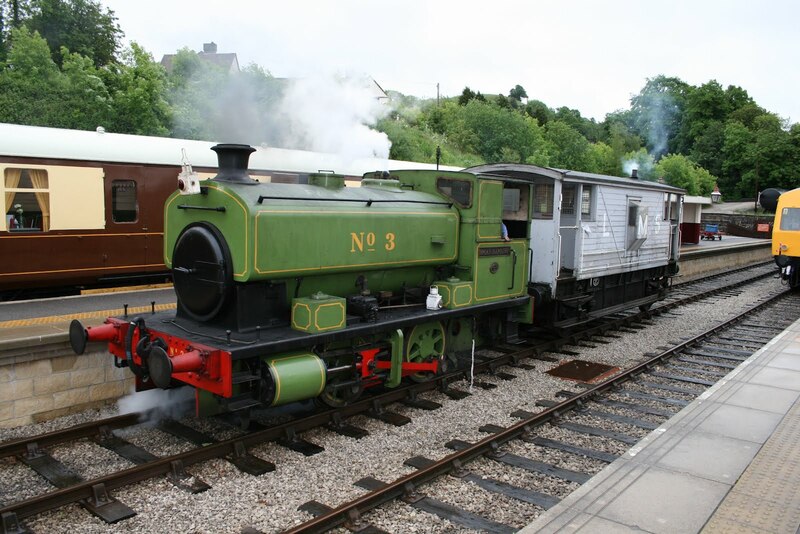 A feature for our visitors and staff was a barbeque on Platform 2 shown against the background of No3. I'm not sure which was creating more smoke. damp but satisfied passengers, and at least the 3 car set was warm and dry. An excellent start to the 4-day Bank Holiday Weekend with reasonable passenger numbers and an excellent performance in the Pullman Buffet! I think the scones went down better than expected! The launch of 51505 back into traffic went very well with many positive comments from the passengers. It shows that the passengers really appreciate the efforts to make the rolling stock clean, tidy and presentable. Down the yard, the DMU team continued with the restoration of the class 119 with a start being made to the panels inside the small First Class Non-Smoking Compartment. Work also progressed on the bubble car with more sanding to the bodywork being achieved. The LMSCA continued work on the Brake Third coach and work progressed on the LMS Brake Van. The 8F group continued working on the boiler of Henry Ellison as well. Into the evening and we welcomed a charter party from the Sutton Coldfield Railway Society who travelled to Ravenstor twice behind No.3 and then on to Duffield on Iris. Today was gentle and quiet before the next seven days of what we hope will be very economically active but the weather may conspire to dampen these ambitions. However, the day saw steady preparation for the weekend ahead with the Up side of E51505 varnished and the destination box restored to be capable of showing our stations including "Idredgehay", happily not required very often. 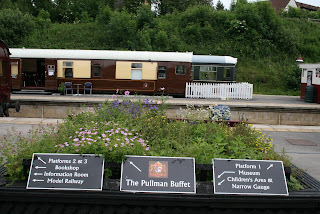 Anton continued with the Wirksworth structures painting and put edgings on the new steps up to the Pullman Buffet Car. I hope this will be the lull before the storm as an inordinate number of volunteers have agreed to cover all the turns required for the next four days and beyond. Fingers crossed that we will start to haul back financially!